Bough Beech is undertaking a major project to change the meadow adjacent to the visitor centre and entrance driveway into an integral part of the reserve. It will have a new orchard reflecting the farming heritage of the site and a sand martin nesting area adjacent to the top pond. STCV have been involved in a number of tasks which are contributing to this new area. 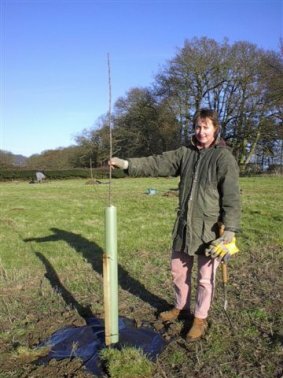 In the Autumn of 2005, we helped Kent Wildlife Trust volunteers plant a damson and cherry orchard. Lynne Flower organised for each tree to be sponsored by KWT members and friends thereby funding the project. The aim is to establish an orchard made up of 7 cherry trees and 15 damsons using traditional varieties grafted onto vigourous rootstocks. The trees are spaced 12m apart to allow plenty of space for large trees to grow, which will provide habitat and food for birds and other wildlife for years to come. Before any trees could be planted the ground needs to be prepared. In the spring STCV volunteers had the laborious task of uprooting annual thistles which had completely overrun this small field. In the cleared area we sowed wild flower seeds which had been collected by KWT volunteers from the Trust's wildflower meadow at Marden. In another part of the field an artificial bank has been built for as a Sand Martins nest site. To provide a screen from the access road an area adjacent o the lake is being planted with willow. The cuttings are about 30cm (12 inches) long and simply pushed into a hole in the wet ground. A very simply means of propagating a wood from a few shoots. The sand Martins should nest in the hump facing the lake behind the planters. The Basket Willow grows in a variety of bark colours, including the green, grey red and yellow being used for this planting. It is fast growing and will thrive in the wet soil next to the lake. Regular harvesting of the willow wands will help to keep the best bark colour on the young shoots while the wands will be used for willow craft or cuttings to grow more willow. The membrane is to keep the grass down while the willow gets established. Later in the year we were able to check on the progress of the willow cuttings planted in March.We estimated about 40-50% success, the cuttings having suffered severely from rabbit damage especially at the edges. The Bough Beech wardens Lynne and Pete are still convinced that the cuttings will soon out-compete the ever hungry bunnies and provide a screen for the sand martin bank, as originally intended! Areas of the reserve are grazed by sheep, when the sheep are moved they tend to wander! A new gate was built to keep then on the right track so that they can safely graze the right meadow.